I am so excited to be posting this recipe! I have a proud history with this and hope you enjoy it too! You are probably asking, “WHAT is Dovi and Sadza?”. Great question! I promise it isn’t just chicken dunked in tomato sauce (I know it kind of looks like that, but it is far from it!). This is a traditional Zimbabwean dish. 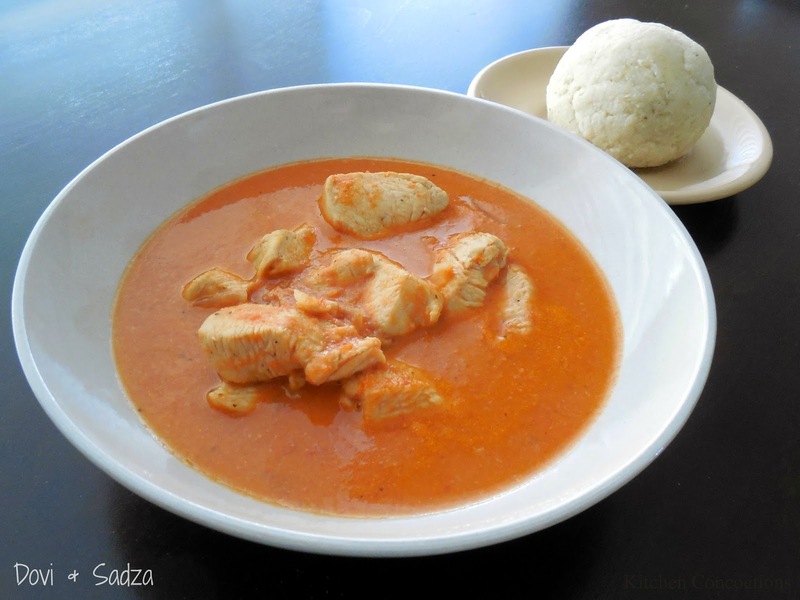 Dovi is a chicken stew made with tomatoes, spices and can you believe it? Peanut butter! Don’t get scared away though! It is fantastic! Sadza, the national Zimbabwean dish, is a corn meal mixture, used to dip into soups and stews. We don’t really have anything like it in the US, but there are similar foods throughout Africa. But just like Asia has rice, and the Italians have pasta, Africans have this type of starchy food (Fufu, from Ghana, and Eba, from Nigeria, are similar foods, but they are usually made with cassava instead of cornmeal). When I went to college I brought the recipe along with me, to make for my roommates. One of my roommates, who told me herself that she was very picky, reluctantly tried Dovi and Saza. Incredibly she also loved it! And then, of course, I made it for my Nigerian boyfriend (soon to be hubby). I think the fact that I initiated making an African dish might have impressed him a little bit. ;) And now, even my 1 year old son happily eats it! This dish is almost as easy as Macaroni and Cheese, and it is a great thing to eat any day you want, rain or shine! Most of the ingredients you probably already have in your kitchen, so you don’t have to go hunting down any African specialty stores for this recipe! For the corn meal I like to use Masa mix (found on the Mexican isle – used for tamales) because it is very finely ground, but I have also used regular corn meal and it works fine too. If I haven’t convinced you yet I guess you will just have to convince yourself. Give it a try! Saute the onions and butter in a stew pot over medium-high heat until the onions are translucent. Add the seasonings and the chicken. Saute until the chicken is cooked through. Puree the tomatoes in the blender. Put the pureed tomatoes, water and peanut butter into the pot with the cooked chicken. Let the soup simmer for about 10 minutes, until the color has changed from the fresh tomato color to a more browned color. Remove the Dovi from the heat and let it begin to cool while you make the Sadza (you don’t want to eat boiling soup). Heat the water to boiling. Once boiling, reduce the heat to medium-low. Slowly add the cornmeal to the boiling water while you quickly mix everything with a wooden spoon. Continue to stir until everything is well combined and the mixture is beginning to form a ball, pulling away from the edges. Wet your hands with water and roll the Sadza into 4 balls. Serve the Dovi with the balls of Sadza. You can pull off pieces of Sadza to dip into the Dovi (this is really fun!) or you can eat it all with a spoon.